Behind The Thrills | The Orlando Eye sets ticket prices, could we have an opening date? The Orlando Eye sets ticket prices, could we have an opening date? 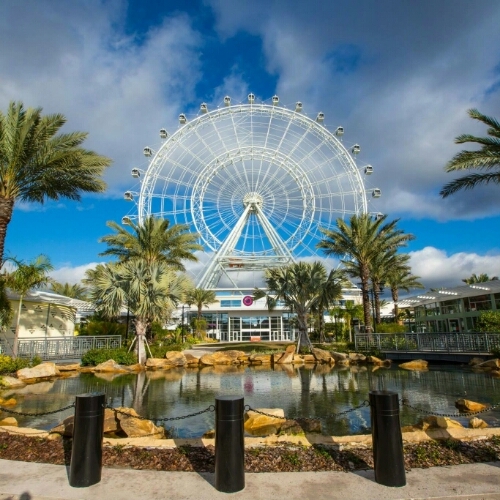 The Orlando Eye sets ticket prices, could we have an opening date? The Official Orlando Eye website has come online with ticket prices for not only the massive new Observation Wheel, but also the other two Merlin Attractions. The three attractions will be the centerpiece of I-Drive 360 in Orlando, and are scheduled to open this Spring. More importantly, we could also have an opening date for all three. Tickets are now on sale for the three major attractions at I Drive 360. Sea Life Aquarium, Madame Tussauds Wax Museuem, and The Orlando Eye are all on sale now. Guests can either buy a single attraction ticket for around $18 dollars when you advance, or can pay just $35 dollars for all three attractions. There are several different combos, and prices, and tickets that either allow you to reserve a time or a felt ticket that allows you to come anytime. There’s also a combo ticket that allows guests to see the three attractions, plus Legoland Florida, with a free shuttle, for around $89 dollars. These are all advance prices, and could go up when the attraction opens. We could also have a clue in the opening date of the attractions, by way of the reservation system. Tickets can be used beginning May 4th. Is that the first official day if operation? There’s a good chance we could see it open sooner, but that seems like a likely date. An official announcement will be made on February 17th. Stay tuned for more from The Orlando Eye, and be sure to get social with us on Facebook and follow along with us on Twitter @BehindThrills for the latest updates! For more information about the Orlando Eye, including tickets, visit the official website by clicking here! Gatorland and Paramount Fine Foods team up for Super Sunday!